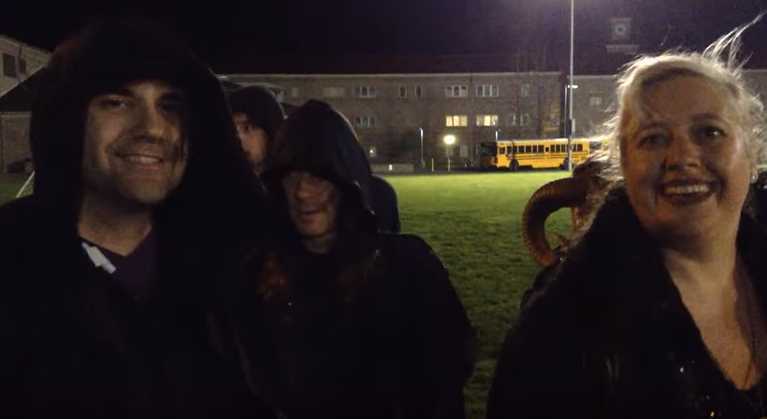 BREMERTON, Wash. — Members of the Satanic Temple of Seattle were met with chants of “Jesus” by students and others after they were spotted last night outside of a football game where they had sought to pray on field. The move was in response to the controversy over Bremerton High School Coach Joe Kennedy, who prayed at the 50-yard line last Friday despite instructions from the school district that he could not allow students to join him in his personal prayers. According to reports, several students had asked members of the Satanic Temple, who are actually believed to be atheists and agnostics, to attend Thursday’s game. The group had asked the district for permission to pray on field in order to make a point about Kennedy’s prayers, but backed off after it was announced that the coach had been placed on leave until he agrees to discontinue his practice of praying on field at the conclusion of games. Coach Kennedy attended the game, but remained in the stands. He prayed with couple Randy and Sharlene Davis, who were present as a show of support. As previously reported, on Wednesday night, the Bremerton School District released a four-page letter outlining that Kennedy had been placed on paid leave over his ongoing prayer practice. The letter said that Kennedy will not be allowed to serve as coach until he agrees to stop praying on the field. The district had presented Kennedy with the option of praying inside of the stadium in a place where none would see him, but he declined. “[L]ike I should be ashamed of my faith and like I should have to hide it,” Kennedy told Fox and Friends on Friday. The Liberty Institute, which is providing free legal representation for the coach, believes that Kennedy’s religious rights are being violated. “No reasonable observer could conclude that a football coach who waits until the game is over and the players have left the field and then walks to mid-field to say a short, private, personal prayer is speaking on behalf of the state,” the group wrote in a letter to the district. While the Bremerton School District placed Kennedy on leave out of concern that it could be leveled with a lawsuit if the prayers continued, the Liberty Institute says that it is considering filing a suit against the district for restricting Kennedy’s religious expression.